The typical configuration for the RV016 Multi-WAN VPN Router. Featuring 16 10/100 Mbps fast Ethernet ports. Product Description - WAN VPN Router, formerly part of the Linksys Business Series, is designed and built for small businesses. It provides connection sharing and secure remote access at the heart of your network to allow your employees to access the resources they need to be productive. Multiple WAN ports can be used for load balancing and redundancy. Strong security features include VPN, a proven firewall, and an optional security service that helps fight spam, viruses, and other threats. The built-in switch can connect devices in the office or additional switches. A secure network connection tying your company to the world is the backbone of your business. You need a combination of performance and security to help keep your employees connected to the assets they need to keep your business productive. The Cisco RV016 Multi-WAN VPN Router is a proven solution that delivers highly secure, high performance connectivity at the heart of your small business network. As its name suggests, the RV016 has sixteen ports in total. Up to seven ports may be configured for load balancing to improve performance or as redundant connections to service providers to support business continuity. Increase remote employee productivity through secure connections to your business network via Virtual Private Networks (VPN). The RV016 delivers high capacity and high performance IPsec VPN capabilities, including support for up to 50 QuickVPN tunnels for remote client access. Intuitive, browser-based device manager and setup wizards get you up and running quickly. The easy-to-understand interface lets you monitor and adjust settings easily, from setting up remote access to content filtering and extensive activity logging. 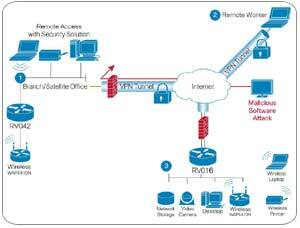 The RV016 provides strong security with proven stateful packet inspection (SPI) firewall and hardware encryption. The built-in firewall also features protection against Denial of Service (DoS), Ping of Death, SYN Flood, Land Attack, and IP spoofing, and sends email alerts for outside hacking attempts. Create up to 50 access rules, and employ powerful content filtering including static URL blocking and keyword blocking. Control filtering of Java, cookes, ActiveX plugins, and HTTP proxies. The Cisco RV016 Multi-WAN VPN Router delivers proven, highly secure connectivity to the Internet at the heart of the small business network to help employees stay productive. Redundant connections support load balancing for higher performance and contribute to business continuity, while a built-in Fast Ethernet switch connects devices in the office. High capacity IP Security (IPsec) VPN capabilities connect other offices and employees working remotely to files and data just as securely as if they were physically connected to the network. Other business-class security features, including available cloud-based web threat protection, help keep the network and business assets safe. The RV016 has sixteen 10/100 Mbps fast Ethernet ports, including 2 WAN ports and 1 dedicated DMZ port. 13 10/100 Mbps fast Ethernet switch ports ensure business continuity with up to 5 ports that can be used as WAN ports for load balancing and connection redundancy. Cisco RV016 Multi-WAN VPN Router, CD with Administration Guide and QuickVPN client software, AC power cable, rack mounting kit.